How Shall We Invite People To SsAM? Eleven of us showed up on Thursday, November 29, 2018 to brainstorm ways to invite people to visit our church so we can welcome and connect with them. After generating 25 ideas, twelve were selected as ideas we could put in place in the next four to six months. Colorful take-away “Moo” cards that visitors to events at SsAM can take away with them, cards members can hand to visitors to take away with them. In addition to a colorful photo or graphic, these cards would have basic contact info printed on them, including the address of this website. Hand out information at concerts. At all events, have something special to hand out. Have a sign-in sheets at events. Use photos of altar and congregation to publicize SsAM. Get to know the shop-owners and local residents in our neighborhood; that is, do basic local demographics. Use social media more effectively including podcasts, Facebook and Instagram. Have a strong spiritual message, something short but catchy. Survey new members. Ask them what attracted them to SsAM and how we can build on the “attraction”. Also ask why they continue to stay at SsAM. Continue “Ashes To Go”. Go out on the streets on Ash Wednesday and offer ashes to passersby. SsAM has been doing this for years. Click here to read more about Ashes To Go. Start a “Laundry Love” program where we occasionally take over a laundromat to offer free laundry services for the homeless and others. Click here to read an NPR article from 2014 about Laundry Love. Celebrate people’s efforts with recognition. Offer informal church services at an outside venue. This was our church’s third brainstorming session about how to invite people to SsAM. 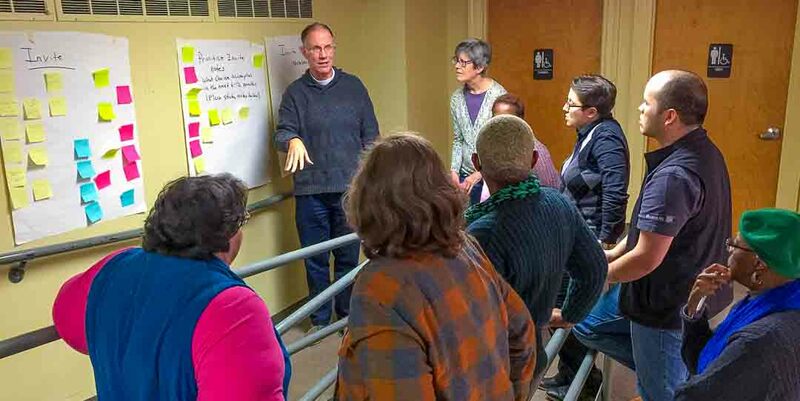 The Vestry did so earlier in the week and, at an October 20, 2018 workshop, 23 people generated 54 ideas. To see all the IWC posts on this website, click here.